Here, a local’s guide to the best places to eat, drink and explore in Catania. Blogger-photographer Laura La Monaca of Daily Breakfast captured 33 beautiful reasons why she lives in Milan, but her hometown of Catania, Sicily, offers very different charms. The largest region of Italy, Sicily lies at the heart of the Mediterranean Sea. Here, she shares some of her local’s guide to the best places to eat, drink and explore in Catania. In the past few years, lots of new restaurants and cafés opened in Vicolo Santa Filomena, a characteristically narrow street in the city center. Among them are: Polpetteria: If you are looking for meatballs, this is your place. I mean, every kind of meatballs, fish balls or vegetarian ones. Try the swordfish in lemon leaves. FUD: The name is a mash-up of food and sud (Italian for “south”). Phonetics are also the key to everything listed on the menu. This could be a bit confusing, but the quality of food won’t disappoint. The Parmigiana burger is one of the best vegetarian options. You can also buy some local products. Look for your local panificio to get the best from a Sicilian bakery. Order a brioche sprinkled with sugar for breakfast, or a pizzetta or a slice of scacciata with cauliflower for lunch. My favorite panificio is Tosto Fabio (Via Caronda, 67). If you prefer to have your meal while comfortably seated at a table, peek into a bar and choose your favorite savory or sweet snack. If you like onions, ordering cipollina is a must; if you don’t mind fried food, try the bomba, like a giant arancine–rice ball. Yes, it means “bomb,” but trust me, you will love it. Savia: This is an institution. It is in the middle of Via Etnea, the main street of Catania. Every time I’m in Catania I go there for gelato. Their gianduia (chocolate hazelnut) is the best in town. Do not expect luxury bars, but rather high-quality wines at good prices. If you want a glass of red wine, try Nerello Mascalese, an indigenous variety from Mount Etna, instead of Nero d’Avola. For some Sicilian dessert wine, ask for Zibibbo, Moscato di Pantelleria, Malvasia or Passito. Try the bar in the local hostel Agorà. In Catania, the Amenano river flows underground and there are only two points where it comes out on the surface. One is in the cathedral square at the Amenano fountain; the other one is in Agorà. In a corner of a dining room, there is even a hidden cave of volcanic origin. Femme Coquette: This shop specializes in design and lifestyle products, from cabinets to kitchenware, from candles to beautiful necklaces. Where to Stay in Catania. To live in Catania like a local, look for an apartment on Airbnb. The best neighborhood is the one in the area from Giardini Bellini to Piazza Cavour. It is really close to the city center, but less crowded. 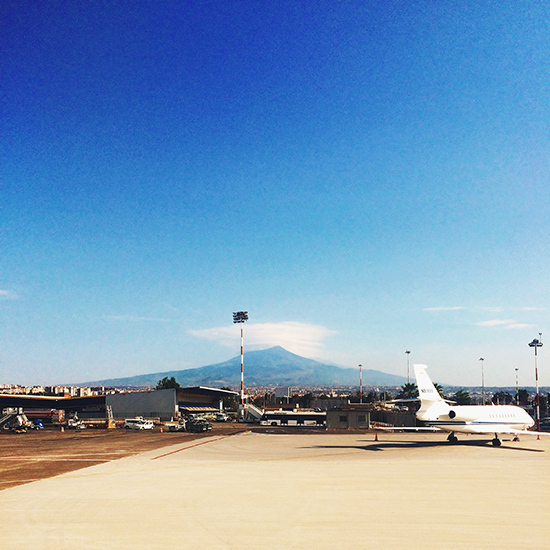 You could find some Sicilian Baroque gems or beautiful penthouses with a view of Mount Etna. If you prefer to stay in a really beautiful hotel, go to Taormina and stay at San Domenico Palace Hotel. You won’t be disappointed. Start your day with an almond and coffee granita with a Sicilian brioche. Explore the city center from the cathedral square, take a tour of the fish market and visit the area nearby: the Roman theater, Via Crociferi, Piazza Università and Piazza Vincenzo Bellini. That’s the location of the opera house named after the composer Vincenzo Bellini, who was born in Catania. His opera Norma gave the name to the catanese dish pasta alla Norma, which is made with tomato sauce, fried eggplant, ricotta salata cheese and basil. Check out Piazza Stesicoro, where you can see the rest of a Roman amphitheater. Then go to Savia—a snack is well deserved! In the afternoon, drive up to Zafferana Etnea and Monte Zoccolaro to see the volcano’s eruption. Go to Caltagiron, a small town close to Catania. It is protected by the UNESCO World Heritage program. The town is world-famous for the production of hand-decorated pottery and its monumental staircase of 142 steps made with different hand-decorated ceramics. Here you could find some unique souvenirs to add a Sicilian touch to your home and kitchen.